Why did you make a relationship with the shaykh (spiritual mentor)? It was done in order to correct one’s ma’amlat (dealings) and that ibadaat (worship) becomes according to sunnah (ways of the prophet (صلى الله عليه و سلم)). This is what is called ba’yat. 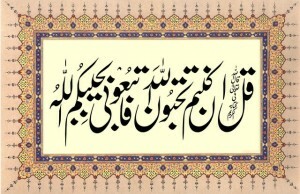 Remember, just merely giving hand in hand to the shaykh is not enough. There is a lot of misunderstanding about this now-a-days. Why are the effects of ba’yat not being seen now-a-days? Before people used to be ba’yat with a shaykh and attain high levels (of spirituality) just within a few days. The shaykh used to affirm that they have fulfilled the right of their ba’yat. Any matter used to arise, they used to inform the shaykh, the shaykh used to prescribe a remedy for it. They practiced upon it and attained high levels due to that. Today, we don’t even inform the shaykh (ittila) about ourselves. Until we don’t have a love and yearning (ishq) for our shaykh and Mashaikh, nothing will happen. This entry was posted in E. States, J. Rights , N. Advice, Q. Akabir, T. Tarbiyet on September 23, 2018 by 'abd.